Right on the heels of my posting yesterday how Mother Nature loves mirrors, another example of this pops into the news! 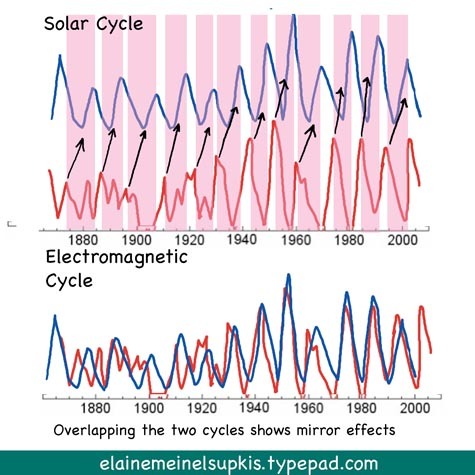 In this case, the solar sun spot cycle mirrors the earth's geomagnetic indices! With a mysterious five to ten year lag! No one has any idea how this works or why it works this way! ♥ The last five solar cycles really battered us and the next one is proposed to be a doozy. Ulimately, the earth heats up because the sun heats us up. The mix of gases in our atmosphere then determines how much is captured and kept within our ecosphere. Ski resort owners should just give up if they are in the lower elevations. There will be no reliable winters for the next ten years at least. The sun definitely cycles. Like all things in nature, it isn't inert but rather has periods of gathering strength and then releasing of energy. Astronomers and geologists now believe the Earth was once locked in ice billions of years ago. This was surmised to be caused by the sun not 'shining' as much light as today. The star wasn't as active, in other words. Then, mysteriously, it 'fired up' and began to warm up the planet about 1.3 billion years ago and life began on earth in ernest. Another mystery! I love these mysteries! In general, cycles tend to be part of something bigger than themselves, seeing how they connect is part of the joy of being an investigator. I am not an astronomer or even a scientist, I was born and raised in observatories...literally. I grew up with this community. I am not so hot with the numbers thing but I 'see' things all the time, it is a gift Pegasus gave me along with a few million volts of pure energy on several occasions. What causes stars to be born and to shine? Astronomers say, they form out of basically loose stuff that gets 'compressed'. 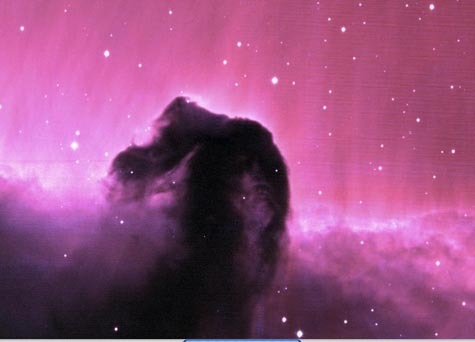 ♥ We see stars forming not too far off from us here in this arm of the Milky Way, such as in the Orion constellation area where we see great clouds and sheets of 'non-shining' stuff, this is where the famous Horsehead nebula resides. ♥ Gould's Belt is around 20 degrees of the galactic plane of the Milky Way. Brilliant, hot, white suns of super-duper size form out of all that 'stuff' that is the envelope of the older, yellow stars. A classic way to detect a smaller galaxy merging with a bigger one is, the new star formation areas are at an angle to each other just like our own mini-galaxy which I will call the Orion Galaxy since the starmaking in that section is most intense right now. When our happy little sun fell towards the Milky Way, the neighborhood became hotter, literally. And the sun became more active, too. Now we are in the grip of greater tidal forces, doubled. And between them, our sun shines quite actively. The earth heated up and the ice melted and life teemed across the surface. The outside forces working on our sun aren't even, there is obviously some pulsation involved over long cycles. We can't see them all..yet. But with the new probes, we see more and more. Even with our current state of knowledge, dating eons-old events in the Galaxy is fraught with difficulty. To be certain by better than a factor of two is to do well. That said, the history of Gould’s belt as currently envisioned is as follows. Perhaps more so than today, the belt in the past comprised a sheet of discrete clouds of gas mingled with stars. Some 30 million years ago an event triggered a burst of star formation at the position of the Per OB3 association [also refered as 'Alpha Per group' -- WebEd.]. This could have been the passage of the last spiral density wave through the area, the collision of a high-velocity cloud falling back through the galactic plane, or the latest oscillation of the belt through the galactic midplane. Any such mechanism would have sufficiently compressed the affected molecular clouds comprising the belt to initiate star birth. Note the quesiness of this passage. Thinking of our sun as part of a smaller galaxy that is now being ripped apart by the Milky Way is scary. So there is a lot of evasion in the thinking of astronomers. They might break out of this and reconsider things. I think it is neat, we came here from somewhere else! This makes our journey through the cosmos most interesting. We have to consider this: we are probably a small piece of the Big Bang that shot outwards in a long trajectory, we sailed through the cosmos for around 8 billion years before we began to close in on the Milky Way that reeled us in like a fisherman brings in the trout. 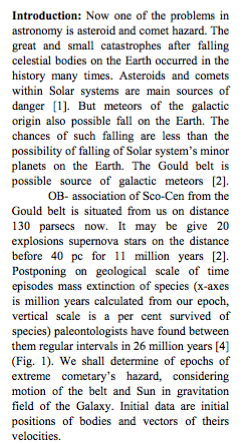 ♥ Click here to read the full PDF document concerning theh Gould Belt and how pulses from it sends meteorites and such flying into our own solar system, creating extinction events.